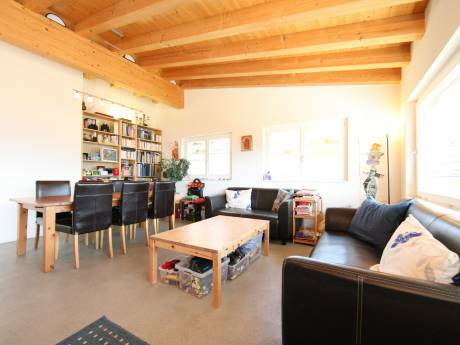 Our modern, smart and well furnished apartment nearby Zug (5min) and Zurich (20min) has 3 1/2 rooms. The aparment is equiped with everything what you need. Parquet, modern kitchen, dishwasher, oven, microwave and fridge with icebox. Within the house, there is a washing machine as well as a tumble dryer. We have a bath tub, a shower and two toilets. In our living room there is a lounge, a big flatscreen (TV) with DVD a multi player system for divx films, a Playstation and a Nintendo Wii. The IPod Music System and a hifi system are available. Furthermore we have a wireless internet access point if you want to bring your laptop with you. The bedroom is equipped with a queen size bed and enough space for your clothes. We also have a balcony with a grill. Right next to the apartment building there is a shop ( www.coop.ch ) where you can buy all the daily stuff (food, magazines etc.). A big plus is the close-by train station with trains to the most beautiful cities zurich (20 minutes) Zug (5 minutes) and Lucerne (25 minutes) all at the lakeside (lake of lucerne, lake of zug or lake of zurich). Franziska (German) and I (Stephan Swiss and French) - are a young couple between 29 and 30 and we live in the heart of Switzerland in Baar. We would like to see the world in a more cheaper and interesting way. We already did a home exchange to Laguna Beach/CA and it was amazing. We both love boating and sailing. Franziska is an optician in Lucerne and graduated a fashion designer school in zurich in 2011. I am an attorney-at-law working for a bank in zurich. We are authentic, responsible and relaxed people who looking forward to socialize and see a lot of places all over the world. 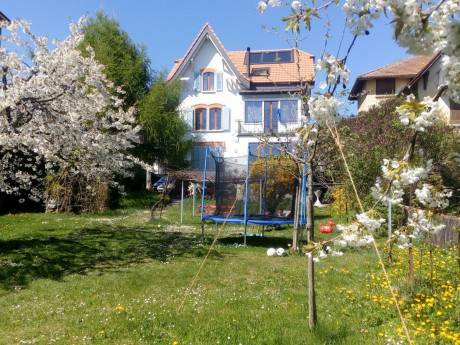 The advantage of our apartment is, that it is very close to the nature and two major cities (Lucerne and Zurich) of Switzerland as well as a smaller city called Zug. It is a very nice apartment and we are proud of it. Important: We are open for every destination! Feel free to wright us, we are happy about every mail! We are very respectful of other people's property and we rely on other homeforexchange people. If you want, we can provide you a lot of hints of how you can spend your leisure time. We are also happy to stay in contact (phone, email) during and after the house exchange so that we can answer to any questions. It would give us a great pleisure to hear from you. Best regards, Franziska and Stephan. For August/September 2013 we would like to go somewhere sunny and warm near the sea (cote d'azure or Miami prefered) for 1 or 2 weeks. calm, nice neighbourhood, in the heart of Switzerland, you can reach nearly every spot in Switzerland within 5 hours by car or train.